If digital transformation is the future of business, then it's essential to be able to measure that transformation. Isobar - a digital agency that works with brands like adidas, GM, McDonald's, and Google - has recently launched a Digital Strength Index (DSI) designed to do just that. "There is a direct correlation between digital strength and future revenue growth and share price performance." Based on over five years of data gathering, analysis and benchmarking, the Digital Strength Index is an aggregate measure of the digital performance of the top 1000+ public companies in the US. The index, created in collaboration with alpha-DNA, a boutique research firm for hedge funds, translates the digital strength score of companies into forward looking top-line growth acceleration expectations. A recent Harvard Business Review article goes into more detail on this research. The headline finding from the first iteration of the Index? That there is a direct correlation between digital strength and future revenue growth and share price performance. 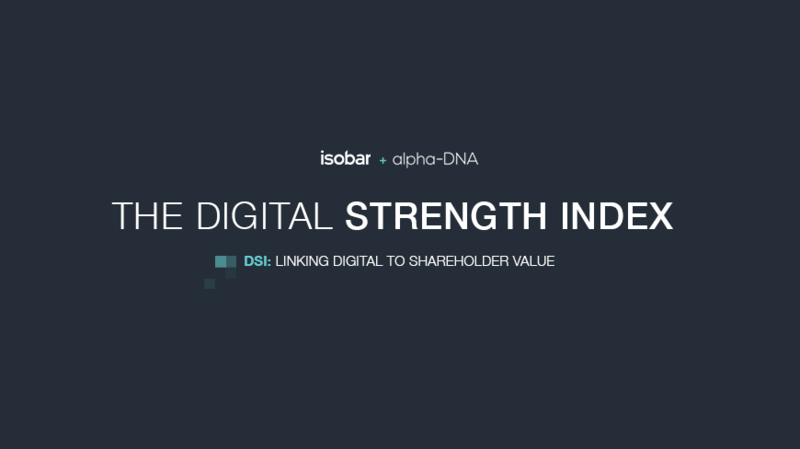 We spoke with Isobar US CEO Geoff Cubitt and alpha-DNA Co-Founder Rod Fertig about the DSI, how it works, and why 'digitally strong' companies are more likely to see the value of their shares increase over time. As the Fourth Industrial Revolution gathers pace, digital transformation becomes table stakes as customers come to expect businesses to deliver instant, personalized experiences. What is the Digital Strength Index, and how does it track a company’s digital transformation? Geoff: The DSI has been created with over five years of data on the 1,000 largest publicly traded U.S. companies. We measure five metrics, including 'Magnitude' (the size of a company's digital presence), Share (comparing digital share to market share), and Momentum (what's the overall trend of digital interactions). In terms of scale, on a monthly basis, we track more than 75 billion digital consumer interactions to hone in on a change in velocity across businesses. With this digital profile and other fundamental data around revenue and market expectations, we can come up with a projection of what we think the growth of that company should be. That's where the hedge fund alpha-DNA comes into play. They actually trade against that disparity between what the market thinks and what the data is telling us. Simply put, digitally strong companies have better management of their data, and a better digital relationship with the market. We've seen that digital strength is a very strong predictor of future revenue growth. How does it predict market performance? Geoff: There's a direct correlation between digital strength and future revenue growth. If you broke up digital strength scores into deciles, you'd see that the leaders, the top decile, their next year’s growth is on average 9.6 percent. And the lowest decile, their next year's average growth is -8.2 percent. And there's almost a completely linear line between the bottom 10 percentile to the top 10 percentile across those different deciles. In short, companies that invest more in digital transformation actually outperform their peers over time. Those companies are more prepared for disruption, better able to monetize new digital channels, and build a bigger user base. This phenomenon exists regardless of industry. Interestingly, it tends to be somewhat stronger in layered industries. So, for example, consumer discretionary industries are probably really strong from a digital standpoint, and energy is probably really weak as an industry. "In short, companies that invest more in digital transformation actually outperform their peers over time." If there is this direct correlation between digital strength and future revenue growth, and if I'm not investing strongly in my digital channels, then I'm really risking the future of my business. If I’m not making those investments, it affects my ability to continue to grow and be a viable concern, and maybe even continue to exist. How does higher DSI predict a higher market share? Geoff: With an industry like retail, there’s a lot of correlation between digital strength and revenue. But there may be other industries where there is not as much correlation between future revenue and digital. And we view that as sort of an indication that those industries may be more likely to be disrupted in the future. Rod: There's a sense in which some companies are better at building a potential customer base within the digital space than others. And that potential customer base may or may not have been translated into actual revenue. But, the potential for revenue is there and we think that's a big reason why those companies tend to outperform over the following years. Are there industries or companies that have a natural inclination toward becoming digitally strong, or alternately, are in danger of falling behind? Geoff: Retail, marketing, and media, have higher digital strength scores, whereas utilities, financials, and real estate have lower digital strength scores. Those higher-DSI score industries, they're in the throes of disruption. The lower-score industries may be saying, "Well, I'm not that likely to be disrupted. There's a lot of reasons why I'm not that worried." But, the concern would be that there's a huge opportunity for disruption in those industries. This is easy to understand in industries that have been significantly disrupted already, like retail. If you look at the retail industry and think about a shopping experience, you might stand in a store and Google the prices or reviews. It's not just a sales channel, it's part of the decision process that a responsible, informed person would take these days, to leverage information that's available digitally, to help make purchase decisions. Our opinion is, hey, why don't you try to be the company that's disrupting your industry? What we see is the market rewards those companies that are more digitally forward-looking. Digital strength gives companies the ability to transform and disrupt their industry in a way that's beneficial to them. Part of what we spent time working with clients on is helping them figure out new market opportunities and products that they can take to market digitally, that are digital-centric, that have the ability to disrupt their industry, and satisfy an unmet need in the marketplace. How should businesses be thinking about redirecting their digital strategies? Geoff: There are really three components. The first is to think more like digital companies do. They focus on building up their digital capabilities and making a strong digital presence. But it's an ongoing process, enhancing, perfecting, improving, and leveraging data and market feedback to tweak and tune the performance of that offering on an ongoing basis. You think about protecting your future value and viability as a business. Second, rethink how you develop business cases to weight digital revenue as higher value than traditional revenue. Because that's more likely your future revenue. Also, consider the shareholder impact of not focusing on digital capabilities and the potential for future loss of market share. The third component is to add a digital-strength measure to your balance score card. So, if other key KPIs that you manage your business to are important, we think it's important to have measures of digital strength as part of that too, to help provide an indication of how your business is performing and where it's likely to perform going forward. What kinds of things should company stakeholders be thinking in regards to digital strength? A few things. Are you increasing your digital presence? Or are you decreasing? Is it shrinking over time? Is your digital share going up or going down? What about your key competitors, is theirs going up or down? Those are the things we think are key to being responsible about managing the future of your business. Do you see DSI superseding existing business metrics? Is this something totally new? Is it simply an evolution of existing metrics? Geoff: We really view this as a new metric, a new KPI, something that isn't being measured today by companies. It certainly isn't being measured by someone who's just asking, "Hey, what's our web traffic?" It's not being measured at the board level. And this is a board-level discussion. We're talking about the future value of a business, the earnings per share of a business, the share price, the market cap, of a business going forward (for more on our argument that 'digital strength' should be a new KPI, see our Harvard Business Review article). Rod: Most companies track what's going on sort of within their walls, in terms of transaction stream, business flow websites, those types of things. I think what the DSI will add is a dimension of outside-in perspective. To say not only what's happening within our walls, but what's happening outside of our walls that is still sort of owned by our brand and company. We really view this as a new metric, a new KPI, something that isn't being measured today by companies. The DSI takes a relative view of all this stuff. So, it's not enough to say, "My visits are up by 10 percent." This view actually ends up saying, "My visits are up by 10 percent, but everybody else's are up by 20 and that's actually bad." So, it is an extension of some of the things that people already track, through business intelligence or just basic digital monitoring. However, to Geoff’s point, this is more of a CXO level conversation, to say, "Where do we stack up relative to everyone else?" Knowing that these have direct implications for both top line revenue as well as shareholder value. “Digital transformation” for many companies means having a web site and a social media channel and that's it. How do companies go beyond that to make digital strength a primary concern? We wanted to take a look at one of our clients where we've done a large scale digital transformation. So we looked at Enterprise Rent-a-Car, and where we had tremendous impact, 26 percent-plus year-over-year revenue growth on digital channels. We mapped the digital strength data against the business and did a before and after and, sure enough: it correlated appropriately. Significant increase in digital share has resulted in additional increase in revenue. There's a direct relationship between this digital transformation and Enterprise separating from industry trends and having increased growth when the rest of the industry has decreased growth. If you're the CEO of a company performing poorly on the DSI, what do you think they should do now? Geoff: Improving their digital strength starts with competitive analysis. Companies need to look at both their direct competitors as well as cross-industry leaders. Then they need to commit to digital strategic planning: how best to leverage digital to transform their businesses and their brands, and customer perceptions of their brands, and their capabilities to stay competitive and to minimize the risk of being disrupted. It’s important to think about, if digital strength is such a strong predictor, are you responsibly running your business?